You can delete your Hiver account by following the instructions given below. Please note that your billing will automatically stop at the point of time your Hiver account is deleted. Choose the 'Delete Account' option and proceed. Additionally, you should also remove the Hiver browser extension from your browser if you had that installed. 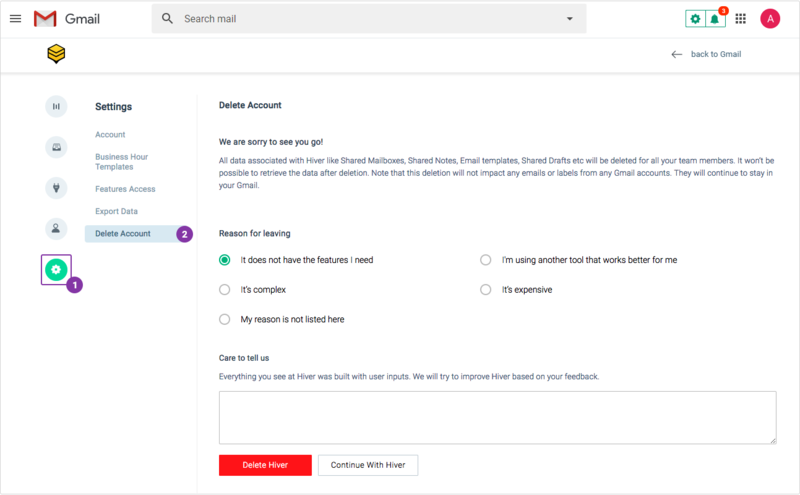 Do note that deleting your Hiver account does not delete any label or any email from any Gmail accounts associated with Hiver. However all data created within Hiver like Shared Notes and Shared Templates will get deleted. Do a Ctrl + F and search for Hiver. Click on the 'Remove' button to delete the Hiver extension. Click on the 'gear' icon to open the drop down and click on 'Preferences'. Click on the 'Extensions' tab to see the list of all the browser extensions. Select 'Hiver' and click on 'Uninstall'.